When it comes to the workplace, we know there’s a lot to learn. We want to help by answering your questions, so our very own industry experts at Express Employment Professionals have offered up helpful answers right here on the Movin’ On Up blog. Here’s our next installment! Question: When should you disclose a disability? Answer: The simple answer is— you are under no legal obligation to disclose a disability. In many cases, it may never be necessary to do so. The best time to disclose a disability is at the point that you see a need for accommodation. Your resume or cover letter is not the place for this information, unless it is central to the organization or to illustrating your benefit to the company. If you will need an accommodation during the interview, such as an American Sign Language interpreter, wheelchair access, or other assistance, it’s best to inform your interviewer prior to meeting for the first time. During the interview, you may wish to disclose if your disability is visually obvious or explains a gap in your employment history. If your disability is not immediately visible, you might wish to inform your employer after you’ve been hired and had some time to build rapport. When you do let your new employer know, be prepared to propose an accommodation, focusing primarily on benefits and solutions. Just as with any conversation with your employer, be sure you have prepared yourself with information and a plan. Thank you to Amy from Express for providing the above answer! 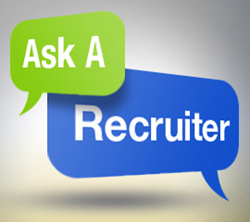 Do you have a question about the job search, hiring, or recruiting process? Now’s your chance to have your question answered by industry professionals who find, interview, and hire people every day. Ask your question in the comments section below and check back soon to read what our experts have to say! Previous Post EXCLUSIVE INSIDER INFORMATION: HOW TO SCORE AN INTERVIEW AND GET YOUR RESUME NOTICED!